Advanced Audio mics aim to provide vintage German tone but at a fraction of the price of the classics. Have they succeeded? Could this offer all you need to get polished sounds from your mic to your computer? This month we look at Arturia iSEM, IK Multimedia iRig Pro and the Warmplace Virtual ANS. Another pedal featuring Boss's Multi-dimensional Processing technology, and the 100th pedal to be added to their range. You may recall how impressed we were with the original Cloudlifter CL1, which was essentially a block of clean DC-coupled gain, driven by phantom power. Drumasonic's reasonably priced drum instrument proves that luxury does sometimes come cheap. FabFilter are on a mission to rethink familiar effects and processors. What does their take on the multi-band compressor have to offer? Over the last few years, Kong Audio have built up an impressive collection of sampled traditional Chinese instruments, which covers strings, woodwind, drums and percussion. Korg's classic drum synth goes global with a makeover and a major update. Wireless systems are often expensive, tricky to use, or both — but this new set from LD Systems is neither! We put it to the test. With digital control, discrete electronics and a saturation processor, Looptrotter's latest device is no run-of-the-mill preamp. Lush Projects' kit could be the cheapest way into modular synthesis for anyone handy with a soldering iron. Numark's Orbit is aimed at DJs, but it also has plenty of potential as an unusual controller for the studio. Sick of taking a heavy amp rack to your gig? Why not go for a mixer that has its own amps built in? Here's our selection of currently available options. This all-valve dynamics processor offers amazing versatility, with uses ranging from sublime transient control to brutal compression. Taking the idea of 'found sounds' to another level, Soniccouture's Geosonics plunders the natural world for its most unnatural sounds. Sonokinetic's latest orchestral venture features a flexible collection of tempo-sync'ed section phrases. PA veterans Studiomaster bring the established powered-mixer format up to date, with USB interfacing and built-in DSP effects. In the hands of Sugar Bytes, familiar effects take on a wholly new identity! With the latest version of EZmix, Toontrack are offering ready-made guitar sounds and master bus processing as well as a huge range of mixing presets. The clever chaps at XILS Lab have given Roland's classic VP330 a new lease of life as a soft synth. Vocal Lix's samples are designed to be used in dance tracks and lean towards R&B in style. Learn how to mimic a classic analogue tape delay with Live's Looper device. Get acquainted with Logic Pro X's slick new Arpeggiator. After introducing the Dynamic Split function in August's Reaper column we revisit it for this tutorial to cut up a recording into a series of short samples. Now that Pro Tools 11 has been available for a while, is it living up to its promise? When your recorded kick drum sound is lacking, Studio One offers numerous ways to beef it up. Migrating Your Plug-ins & Settings To Sonar X3. Get more done in less time, with these workflow tips for Cubase 7. A little preparation in Reason should see you ready for anything. 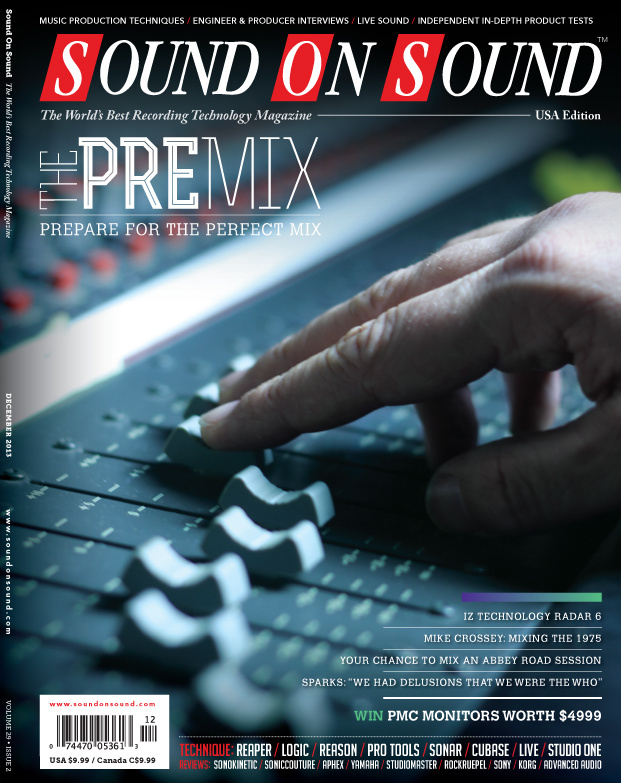 This month, Session Notes goes upmarket, giving readers a chance to get their mitts on a professional multitrack session from the world's most famous studio. This month we analyse Bing Crosby's 1947 Christmas classic "White Christmas” as well as a number of contemporary commercial hit record productions. Pro mixers do great work because they're not distracted by problem-solving. With the right preparation, you can do the same. Björk's stage show is bizarre and beautiful, and it takes a team of dedicated musicians, technicians, programmers and designers to make it happen. Back in the era of analogue tape and non-automated analogue mixers, you could walk into any studio and — other than perhaps trying to figure out the patchbay — start recording and mixing. This month our selection includes albums from Junkfoxx, Retrodog, Marcus Reeves, My Youth, Pete Thomas & The Horns A Plenty, The Wicked Whispers, Into The East and Adamrake. The 1975's chart-topping album is just one of a string of hit debuts engineered, mixed and produced by Mike Crossey. Do Bakelite knobs have a place in the virtual world? From elaborate band arrangements to their pioneering collaborations with Giorgio Moroder, Sparks' music has always been innovative and instantly identifiable. The introduction of 'inter-app audio' in iOS 7 provides a new level of integration between music apps. If your hard drive becomes cluttered, your PC's performance will suffer. So how do you free up space without it becoming a chore? How do shotgun mics achieve such a tight polar pattern compared with other designs? Read more about Q. How do shotgun mics work? Q. Should I use balanced or unbalanced connections with my live console? As I use several sound sources at club gigs and festivals, I usually prefer, to sub-mix myself. Read more about Q. Should I use balanced or unbalanced connections with my live console? Life as a jobbing musician has always been tough, but at least the risk of drowning isn't quite as high these days. Whatever your political views, 'Obamacare' can only be a good thing for musicians and engineers. Spread across two locations, the LA-based recording empire named Westlake Studios has played an important role in the making of some of the best-selling albums in the history of recorded music. Media content for the December 2013 issue.